The American Veterinary Society of Animal Behavior (AVSAB) has adopted a new position statement on positive veterinary care. This document emphasizes the importance of making visits to the veterinarian free of stress, anxiety, and fear. 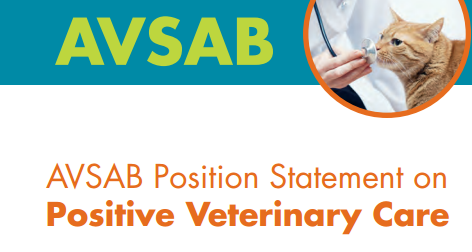 This statement outlines why fear-free veterinary visits are so important and provides guidelines for veterinary practices, as well as other pet care professionals, as to how they can make this happen. I believe that making the care and training of a pet free of pain, force, and fear is equally essential for animal shelters, boarding kennels, daycares, dog trainers, dog walkers, groomers, pet sitters, and rescue organizations, as it is for veterinarians and their staffs. I encourage every pet parent/guardian/owner, whatever you call yourself, as well as every pet care professional to read and implement these guidelines. Please share this position statement with those that have pets and anyone that cares for your pet. Kate and Don discuss why training a dog is so beneficial to all involved; the dog, the dog’s immediate family, and society in general. They discuss the advantages of working with a certified professional dog trainer so that you have someone that can coach both you and your dog when things are not going as expected. Additionally, they discuss why choosing a trainer that is committed to pain-free, force-free and fear-free training is so important. 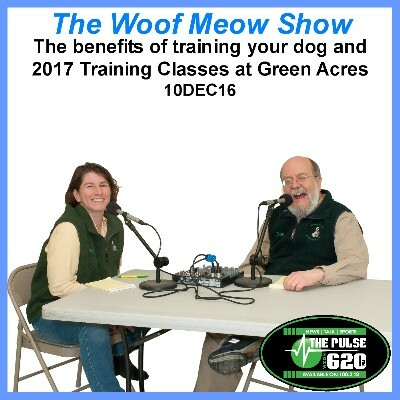 Lastly, they discuss the training classes that will be offered at Green Acres Kennel Shop in 2017. Pet Behavior, Vets & The AAHA Canine and Feline Behavior Management Guidelines with Dr. Dave Cloutier from Veazie Veterinary Clinic – In this week’s show Kate, Don and Dr. Dave Cloutier of the Veazie Veterinary Clinic discuss the American Animal Hospital Associations (AAHA) new guidelines on behavior management for dogs and cats. This groundbreaking document represents the first time that a major veterinary organization has addressed pet behavior. According to the guidelines “More dogs and cats are affected by behavioral problems than any other condition, often resulting in euthanasia, relinquishment of the patient, or chronic suffering.” Tune in and learn why behavior is so important and why a behavioral assessment should be part of every pet’s annual wellness exam. Dr. Cloutier, Kate, and Don discuss reasons for an increase in behavior problems, and how these problems can best be addressed. Dr. Cloutier explains changes he and his colleagues have made to work towards free-free visits for their clients. We address serious behavioral problems such as separation anxiety and aggression as well as nuisance behaviors like jumping, barking, and counter surfing. We address how veterinarians and dog trainers can work together and why it is essential to focus on rewarding desired behaviors and removing rewards for unwanted behaviors. Lastly, we review the guidelines recommendations on refraining from using any training methods that use aversive techniques such as electronic shock collars, choke collars, prong collars, alpha-rollovers, and other things hat work on the basis of fear, intimidation, force, discomfort or pain. Canine Behavior: Myths and Facts – This is a follow-up to our show of March 12 when Kate and Don discussed the AAHA Canine and Feline Behavior Management Guidelines with Dr. Dave Cloutier from Veazie Veterinary Clinic. In that show, we discussed how behavior issues have become a significant issue and how many of those behavior problems have been caused, at least in part, by people’s misconceptions about canine behavior. This week we examine what people think they know about dogs and where that information is coming from and how reliable it is as a source of facts. We then discuss several myths about canine behavior and counter them with what science has shown to be the facts. Myths examined include: dogs are wolves, dogs are pack animals, people must be dominant, or Alpha over their dog, punishment and aversive tools are necessary to train a dog, dogs should work for praise alone, growls are bad, all dogs like all other dogs, crate training a dog is cruel, all dogs need a job, getting a second dog solves behavior problems, dogs do things to get revenge, dogs know right from wrong, and dogs and kids go together like peanut butter and jelly. Facts that we bring to light include: dogs respond very well to benevolent leadership, dogs benefit from training, food rewards work very well for training, wolf packs are about families cooperating, dogs only form loose association with other dogs, growls are a beneficial way for a dog to communicate that they are feeling threatened, you are not a bad owner if you do not take your dog to daycare or the dog park, dogs are den animals and hence most love their crates, dogs need both mental and physical stimulation, behavior problems can be contagious, dogs know safe from dangerous, and dogs and kids are lots of work. The Four Essentials to A Great Dog – Don and Kate discuss the four essentials to a great dog. In their experience most great dogs are the result of time and effort by both the person and the dog, which is exactly what that they teach students in Green Acres Kennel Shop’s Basic Manners classes. The four essentials are; Knowledge, Relationship, Management, and Training. Tune in and learn how you and your dog can become a great team and best friends for life. Dog Training Questions for Don and Kate with special guest host Dr. Mark Hanks – part 1 – Dr. Hanks interviews Don and Kate about their experiences as professional dog trainers. He asks Kate and Don about how training has changed in the past 26 years since Mark began his practice, why training a dog is important, the importance of training for mental enrichment, how breed effects training and compatibility with a family, how human intervention has adversely effected health and behavior, researching dogs before one decides what dog and breed to get, making temperament a key decision when picking a dog, what we typically teach a client and their dog, Green Acres holistic approach to training (husbandry, nutrition, body language, ethology, and training), inadvertent reinforcement of undesirable behaviors, the continuing necessity to refute antiquated and inaccurate myths about canine behavior, the optimal age for starting training, the structure of Green Acres training classes, Green Acres program to help parents find the best pet for them, how family lifestyles have changed and how that affects time for a dog, knowing when to wait before starting a group training class, and how they deal with special needs rescue dogs. Dog Training Questions for Don and Kate with special guest host Dr. Mark Hanks – part 2 – Dr. Hanks asks Kate and Don about: Green Acres holistic approach to training (husbandry, nutrition, body language, ethology, and training) and how we work with families to understand their dog and the importance of having a good foundation of education so people can better understand their dogs, how some students may attend class without their dog either because their dog is sick, in heat or simply because the dog learns better at home, private training options at Green Acres, the critical period of puppy socialization and habituation, why socialization needs to be actively planned and implemented by owners – it doesn’t just happen, what do you do you when want your puppy to be a therapy dog, the difference between therapy dogs, service/assistance dogs, and emotional support dogs, the fake service dog epidemic, can you teach an old dog new tricks, how do you deal with constant barking, and how do you deal with clients that need the dogs behavior changed tomorrow. Dog Training Questions for Don and Kate with special guest host Dr. Mark Hanks – part 3 – Dr. Hanks asks Kate and Don about: dominance, pack hierarchy and alphas and the current science which indicates wolves are a cooperative social species, the benefits of kind leadership as opposed to coercive based leadership, the myth of dogs doing things just to please us, temperament and personality in dogs, the importance of knowing parents because of the genetic role in temperament, “stubborn” dogs versus under-motivated dogs, epigenetics and the possibility of mental health disorders in dogs like autism and PTSD, and temperament as a continuum and nature versus nurture. What Is A Pet Behavior Consultant? A pet behavior consultant is someone that is trained and credentialed in animal behavior. These specialists can help you understand an animal’s normal and abnormal behavior and whether not an animal would be appropriate for a particular role. 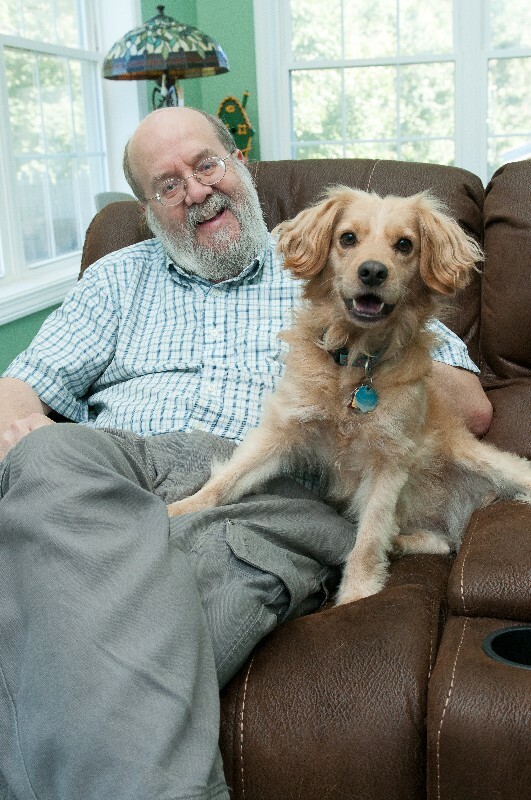 They also specialize in assisting pets with behavioral problems, just as mental health professional’s work with people. Unlike an animal trainer that focuses on teaching an animal to offer a particular behavior when given a specific cue, behavior consultants typically work with animals exhibiting an undesirable behavior based on instinct and emotion. Those working in pet behavior will typically be a member of one one more of the following organizations; the International Association of Animal Behavior Consultants (IAABC), the American Veterinary Society of Animal Behavior (AVSAB), The Animal Behavior Society (ABS), and the American College of Veterinary Behaviorists (ACVB). Like you I want my pets to have a long, healthy, wonderful life. That is why I appreciate that there are so many healthcare options for our pets. My pets have both a traditional veterinarian and a homeopathic veterinarian. As of this fall, Muppy is also seeing a specialist in veterinary chiropractic care and Chinese medicine and acupuncture. I had recently noticed that Muppy had occasionally started sitting with her right leg out to one side, much like our dog Gus had done for most of his life. Muppy was showing no obvious signs of pain or discomfort, but as we know, dogs hide these things well. 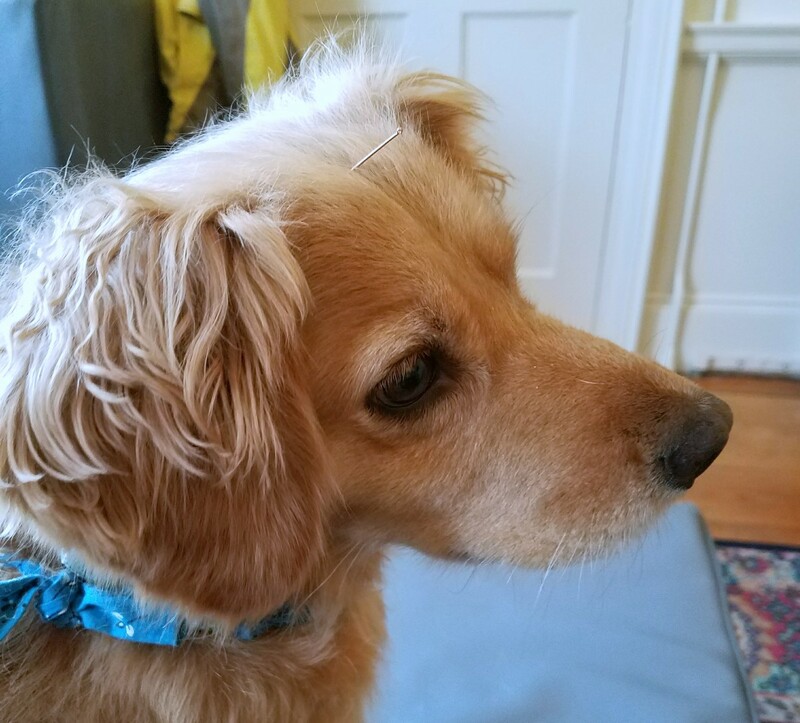 Muppy does like to fly off and on our deck so I was concerned about a possible orthopedic injury, and since Gus’ started sitting normally after his first chiropractic adjustment, I decided that taking Muppy to see a veterinary chiropractor for a preliminary exam made sense. I like having the little scamp around, and if there is any chance she is in pain, I want to address that sooner rather than later. As we entered the office, Dr. Munzer greeted Muppy with a treat. That was a brilliant move because he made a friend for life. He allowed Muppy to meet him on her terms and while we discussed the reasons for our visit, Muppy was allowed to explore his office and get comfortable. She felt so relaxed she started getting into things on Dr. Munzer’s bookshelf before joining me on the futon as I talked with Dr. Munzer. This served two purposes; Muppy had time to settle in, and Dr. Munzer had the opportunity to watch her and assess her posture and gait; an important part of a chiropractic exam. Checking the color, shape, size and coating of Muppy’s tongue. The tongue is examined as part of a Chinese medicine exam as it is used to assess circulatory status, systemic temperature and pain/stagnation. Examining Muppy’s head, ears, spine and extremities for heat or cold. Going over her skin and coat looking for any abnormalities or sensitive areas. Checking the condition of her nails and footpads. Scuffed nails/pads are a sign of toe drag, which may indicate an orthopedic or neurological problem. Palpating the spine, limbs and surrounding muscles for pain or trigger points. Muppy exhibited some discomfort in her lower spine. Tracing along the acupuncture meridians and looking for twitch responses and feeling for deficient Chi points. Checking the femoral pulses for symmetry, rate, strength, depth and character. Moving all the joints of the spine and extremities to assess if there are restrictions on the range of motion or if any joints are stuck out of neutral. After the initial exam, Muppy received her first chiropractic adjustment. She was on top of a large foam block with me sitting in a chair near her head. Dr. Munzer gently adjusted the joints that were out of alignment. Following the chiropractic adjustment, he repeated his exam of the acupuncture meridians. This was followed up by the insertion of acupuncture needles at several points. The needles remained in place, and Muppy remained calmly on the table, for several minutes. 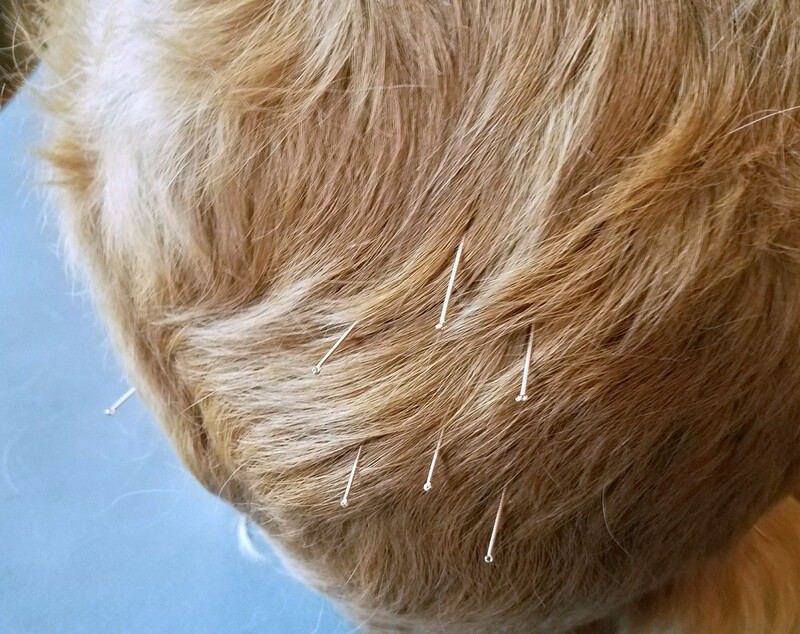 I remember that Gus would fall asleep during his acupuncture treatments, a not uncommon reaction to acupuncture. At the end of her treatment, the acupuncture needles were removed, and Muppy hopped off the foam block, and we went home. Since her first treatment, she has been moving better. She had her second treatment a week later, the third treatment three weeks after the first, and will have her next one a month after the last. Both chiropractic and acupuncture treatments focus on preventative care. So when should you consider acupuncture for your pets? Acupuncture can be very beneficial for treating pain as well as noninfectious inflammation such as that caused by allergies. It can be helpful for neurological issues; Gus was treated for idiopathic epilepsy, and it did reduce the frequency of his seizures. Acupuncture is also helpful in the treatment of musculoskeletal issues like arthritis and disc disease. It can be beneficial for treating feline asthma and gastrointestinal issues and even behavioral problems. You might want to consider chiropractic care for your dog if they have any mobility issues or as in my case if you see something that does not look normal, but there are no obvious indications of pain or discomfort. Muppy is feeling better since she started her chiropractic and acupuncture treatments and that makes me happy. POST PUBLICATION UPDATE – Muppy had her fourth adjustment and treatment yesterday (6DEC16). He joints were moving freely and without discomfort and her Chi was strong. She will be going back for her next checkup in one to two months. People that know me have learned that I am a fan of using natural remedies whenever possible; however, I also always tell people that “natural” does not mean something is safe. One of the natural remedies I have used with myself are essential oils. I have recently started studying their use with animals and in that process have learned that Birch is one of the oils that is not safe for use with pets. That caused me to take notice as I have friends who do canine nosework and it is my understanding that Birch is one of the first scents that they are trained to find. Today I asked some of those friends if they knew why Birch was selected and if they had heard anything about potential issues with Birch, and they had not. The web site http://www.natural-dog-health-remedies.com/ lists the following essential oils as unsafe for use with dogs; Anise, Birch, Camphor, Cassia, Clove leaf and bud, Hissop, Horseradish, Juniper Wood, Mustard, Pennyroyal, Rue, Tansy, White Thyme, Wintergreen, Yarrow, and Wormwood. Essential oils have many wonderful health properties, but please make sure you talk to your pet’s veterinarian before using them. Shared Blog Post – Are You Failing Your Patients in This Major Way? This post appeared on the blog of Dr. Andy Roark. Written by, veterinarian Dawn Crandell, her opening paragraph reads “There needs to be a shift in veterinary medicine, and it can’t happen too soon. It isn’t about the medicine. It is about the way we view our patients. And it is all about behavior.” While this post is geared specifically towards veterinarians and their staffs, it is applicable to any of us in the pet care services industry as well as pet owners. It is so nice to see the world coming around and moving forward with a new, informed attitude on pet behavior. If you are a pet care professional (veterinarian, vet tech, vet assistant, dog trainer, pet care technician, groomer, or shelter worker), read this article so you can do the best possible for the pets in your care. On Talking Terms With Dogs: Calming Signals, Turid Rugaas, Dogwise Publishing, 2006, An excellent book on understanding a dog’s body language. Includes descriptions of how you can use your own body language to better communicate with your dog. The Other End of the Leash – Why We Do What We Do Around Dogs,Patricia B. McConnell, Ph.D, Ballantine Books, 2002, An information-packed, immensely readable book. In it you will learn how to have a better relationship with your dog through better communications. Dr. McConnell clearly explains the manners in which dogs and their people communicate. For the Love of A Dog Understanding Emotion in You and Your Best Friend, Patricia B. McConnell, Ph.D, Ballantine Books, 2005, 2006, A superb review of emotions in both dogs and their people and how they bring us together and can rip us apart. Once again Dr. McConnell helps us to better understand our dogs and in doing so have the best possible relationship with them. Dogs: A new Understanding of Canine Origin, Behavior and Evolution, Raymond and Lorna Coppinger, University of Chicago Press, 2001, An evolutionary biologist and dog lover, Coppinger outlines the likely process which resulted in the longstanding canine-human relationship. Stress in Dogs, Martina Scholz and Clarissa von Reinhardt, Dogwise Publishing, 2007, This book outlines the physiology of stress in dogs, signs of stress, and how to make your dog’s life less stressful. It emphasizes that more activity and involvement in dog sports is often not the answer to reducing stress in dogs but can be a major contributing factor. This book is a must read for anyone with an anxious or hyper dog. The Culture Clash, Jean Donaldson, James & Kenneth Publishers, 2005. An exciting book by an outstanding dog trainer and one of Don’s favorites. Donaldson makes a powerful case for thinking in terms of behavior modification rather than the older and more anthropomorphic dominance models of dog training. Includes an excellent section on operant conditioning. Winner of the Dog Writer Association of America’s “Best Behavior Book” award for 1997. The Power of Positive Dog Training, Pat Miller, Howell Book House, 2001. I have been reading Pat Miller’s articles in the Whole Dog Journalfor years and have loved everything she has written. She is a skilled and compassionate dog trainer who really knows how to communicate to dog owners through her writing. This book is a superb “basic dog book” for anyone with a dog, and I highly recommend it. The Dog Whisperer, Paul Owens with Norma Eckroate, Adams Media Corp., 2007. This book emphasizes a compassionate, nonviolent approach to dog training. It offers great advice on building a relationship with your dog and shows you how to teach your dog all of the basics they need to be a great companion. Don’t Shoot the Dog – The New Art of Teaching and Training (2ndedition), Karen Pryor, Bantam Books, 1999. A pioneering book using shaping to change behavior in animals – dogs, cats, even humans. Training Your Cat, Dr. Kersti Seksel, Hyland House Publishing, 1999. Written by an Australian veterinarian, this book is an excellent primer on cat behavior, care and training. While many people think cats cannot be trained, this book demonstrates exactly how easy training a cat can be.